The Nespresso Creatista Plus is a capsule coffee machine that gives you more control over your coffee than you would get at a café. 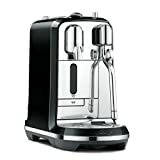 It is a machine that, after a few practise rounds, results in you making the perfect coffee to suit whoever is drinking. You can have fun with latte art too. While the Nespresso Creatista Plus machine is an automatic capsule unit, Nespresso has put a lot of effort into giving control back to the user. Not only does it offer eight beverage selections at three different volumes, from black coffees to milk-based, but you can choose what texture of milk it steams using the wand, and 11 temperature settings (from 56 to 76°C). See also: The 11 BEST Coffee Machines of 2018. While that might sound complicated, it’s not. Simply choose and insert your Nespresso pod, select your choice of drink on the high-resolution display and press start. While that is pouring using its impressive 19 bar-pressure, chose your milk setting, lower the milk wand into the milk jug and press start. Alternatively, as you become more advanced, you can choose the manual option and steam the milk without automation. Cleaning is also a breeze. The stainless-steel design means it’s easily wiped down, the drip tray is simple to remove and rinse and the used pod-catcher is easy to empty. It also has an automatic descaling function. But perhaps the best feature is the frothing wand which runs an automatic cleaning cycle after each brew, meaning the milk won’t clog the wand. It’s an elegant unit that doesn’t try to be the focal point of the room, but when the eye catches it, is pleasant to look at. Its sophisticated user interface and sleek lines mean it will compliment any bench top and its stainless steel build is solid and not flimsy. Essentially it feels like what you have paid for. 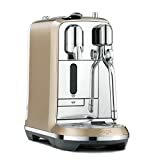 Cleverly, because of it’s narrow but deep design, Nespresso has managed to equip it with a massive 1.5L water tank – one of the biggest on the market but somehow isn’t intrusive and has a heat up time of just 3 seconds. Essentially you could make up to 60 25ml espresso drinks before needing to refill the water. 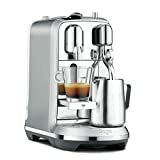 While its dimensions of W17.7cm x D39.3cm x H30.8cm are not too far off from some of its closest rivals, the Nespresso Creatista Plus is heavy, weighing at 5.2kg and without water in it. It operates at 1,600W, which is a lot more than other models of comparable size. However, the increase in wattage is to operate its larger heating element and pump, which results in your coffee being brewed faster and at higher temperatures. 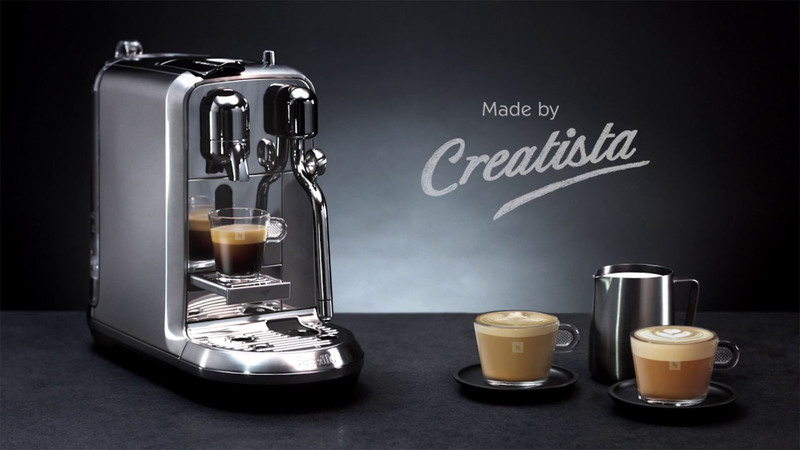 The Nespresso Creatista Plus is not a cheap unit, but you really do pay for everything you could ever want in a home coffee capsule machine. It looks nice, pours perfect coffee every time and offers versatility and customisation that no other machine on the market does. Plus, you get to play around with creating latte art. The ideal unit for the budding barista in all of us. Read next: Jura E6 review: An excellent bean-tocup coffee machine that’s fully automatic.